Country music star Dierks Bentley is currently on his 2014 RISER TOUR. On tour with Bentley is an impressive Harman lighting and audio solution. 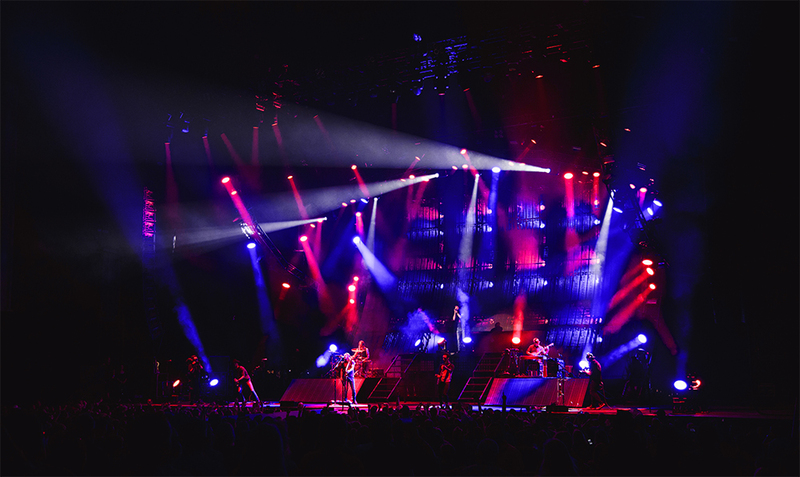 Video Equipment Rentals (VER) is supplying the audio reinforcement system featuring JBL’s VTX line arrays and Crown I-Tech HD amplifiers, and Christie Lites is providing a full Martin rig for the dynamic lighting system, headed by MAC Quantum fixtures. On the lighting side, Chris Reade, Dierks Bentley’s Lighting Designer, uses Martin’s MAC 2000 Wash, MAC 700 Profile, MAC Viper Profile, MAC Aura and MAC Quantum Wash, all provided by Rod “Red” Gibson of Christie Lites. The Lighting Crew Chief is Marc “Chainsaw” Wuchter and the Production Designer is Bruce Rodgers of Tribe, Inc.
Reade also said he enjoys the MAC Auras as well and typically uses them in groups to add to the effect, while the MAC 700 Profile is used for front key lights to provide a great look. He also uses the standard MAC 2k Wash for color wash and punchy stabs when they are zoomed in. The audio system features a left-right hang of JBL VTX V25 line array loudspeakers with VTX S28 subwoofers in cardioid configuration. For side fill, VER has supplied V25 loudspeakers along with G28 ground-stacked subwoofers. Powering the V25 loudspeakers are Crown I-Tech 4x3500 HD amplifiers, with I-Tech 12000 HD amps powering the subwoofers.